Initially is proposed a definition of the term «system»; are then presented solid acquisitions of the systemic approach and open or problematic question are discussed. Are briefly presented the six systemic seminars held during 2012 by authors coming from different disciplines, such as physics, theory of systems, system engineering, philosophy, biology, epistemology, classical philology. Are exposed and discussed some relevant theoretical questions debated during the seminars. Are also exposed and criticized different conception of the term «matter» to be found in the history of philosophy, in the sciences and also in common sense. «Matter» has been the topic of a privatissimum seminar. In quantum field theory, the phenomenon of coherence plays a crucial role in the description and understanding of a large number of physical systems, in elementary particle physics, condensed matter physics, cosmology and biological systems. The coherent structure of the vacuum, or minimum energy state, manifests itself in the auto-similarity properties of fractal structures which are observed to occur in a large number of natural phenomena and systems. This leads us to an unified physical picture at the ecological scale. The conception of Nature split in closed, separated domains is replaced by the vision of Nature modulated and unified by laws of form implied by the underlying quantum dynamics of the coherent vacuum. Any distinction or antinomy between structure and function is dissolved in such an integrated ecological vision. This contribution deals with the concepts of «self-organization» and «emergence», starting from the physico-mathematical approach to phase transitions. In this regard we evidence the strong limits of this approach which prevent from its application to the study of self-organization and emergence processes within the biological realm. This circumstance raises a number of philosophical and practical difficulties, because this approach cannot account for both the logical correctness of a number of philosophical arguments, and the huge quantity of observational data collected in different scientific contexts. In order to suggest an escape from this situation without renounce to the use of mathematical models we propose to introduce a suitable generalization of the physico-mathematical approach, consisting in dealing with the systems as open and interacting with an external environment. We show that this framework could, in principle, avoid some contradictions and paradoxes which characterize the actual scientific and philosophical research on complex systems. The paper presents a philosophical analysis of the concept of control based on a specific characterization of the structure of control systems. The paper is subdivided into four sections: in the first and the second sections the control dynamics is described and interpreted, while the last two sections briefly cope with the relationships between control, teleonomy, teleology and freedom. This essay shows how it’s possible to focus on an aspect of reductionism from a methodological point of view that is compatible, at least in principle, with a systemic perspective. The first part of this paper deals with the epistemological assumptions of interpretive models of cancer. Interestingly, they appear to be opposite each other, since they call on reductionist or anti reductionist perspectives. However, in the first sections it’s also showed that reductionist models present certain dimensions that are not of a reductionist nature. The paper also shows how analytical and synthetic approaches are mutually implicated. Reductionism, understood as an epistemological approach and not an ontological claim, plays a role in the general explanation and comprehension of a biological phenomenon, yet it specifically explains that of tumours. This allows the possibility of taking a reproducible subject of the investigation, to an organizational level, which ultimately is integrated ontologically with other levels as well. The paper concerns the notion of knowledge and argues that knowledge is not to be identified only with episteme (i.e. true and demonstrated belief) but with right opinion too, if we want to avoid both skepticism and relativism. In order to get over the ancient dichotomy between doxa and episteme we have to reform both of them, adopting a systemic approach. The systemic view can help us define knowledge as a dynamic set, where change is possible and where novelties can always come out. Knowledge is a difficult achievement, but we really can grasp some truth, even if not all truth, because the world is very complex and subtle, while our cognitive skills are limited. Rhetoric, as «art of persuasion», is active in almost all our communicative relationships but since long time it has been interpreted in a negative sense that we can overcome only recovering, as necessary condition, the systemic theory of it, founded by Aristotle. Rhetoric is at the same time a theoretical and a practical art, as the Greek word rhêtorikê means. We have to understand it as a faculty (dynamis) and not as a science (epistêmê). 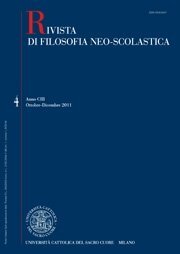 The author presents the Aristotelian optimistic sense of «verisimilitude» and of «persuasion», a positive judgment that we can maintain only if we resist to the temptation of identifying rhetoric with only one or two of its several constituent parts. Realizing that rhetoric is an open «system», we can understand more easily its complex structure, where each part has a specific goal connected to the one of the whole, always in relationship with the external environment. To prevent well known possible degenerations due to the strong power of this art, we must not forget that the rhetoric system is originally a subsystem 1. of the wider political/ethic system and 2. of the logic/dialectic one. The author considers – as archetypical sources for this complex systemic theory of rhetoric – works like the Greek Rhetoric of Aristotle and the Latin Rhetoric to Herennius, the contents of which can be combined and are still valid. This paper aims to propose a synthetic view of the original, systemic perspective of rhetoric, not to discuss specific problems.